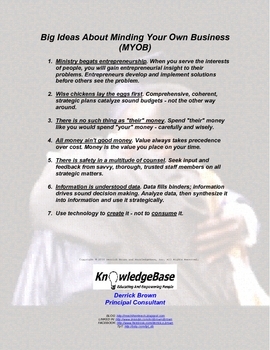 "Big Ideas About MYOB" Handout / Poster by Derrick Brown's "Reach - Then Teach"
1. Ministry begats entrepreneurship. When you serve the interests of people, you will gain entrepreneurial insight to their problems. Entrepreneurs develop and implement solutions before others see the problem. 2. Wise chickens lay the eggs first. Comprehensive, coherent, strategic plans catalyze sound budgets - not the other way around. 3. There is no such thing as "their" money. Spend "their" money like you would spend "your" money - carefully and wisely. 4. All money ain't good money. Value always takes precedence over cost. Money is the value you place on your time. 5. There is safety in a multitude of counsel. Seek input and feedback from savvy, thorough, trusted staff members on all strategic matters. 6. Information is understood data. Data fills binders; information drives sound decision making. Analyze data, then synthesize it into information and use it strategically. 7. Use technology to create it - not to consume it.